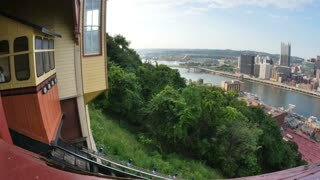 Search Results for "mount washington"
The Duquesne Incline carries passengers down Mount Washington on Pittsburgh's South Side. PITTSBURGH, PA - Circa August, 2014 - An establishing shot of the Monongahela Incline as it travels up and down Mount Washington near downtown Pittsburgh, PA.
Aerial shot above Mount Washington Auto Road in New Hampshire. The road winds up to the clouds, through a thick forest peppered with fall foliage colors. Fireworks celebration in Pittsburgh, Pennsylvania; seen from Mount Washington on July 4th, 2018. 1953 - Soldiers hike on a snowy trail to test cold weather clothing on Mount Washington in New Hampshire. 1920s: UNITED STATES: view along valley floor. Mount Washington sign. Accommodation sign. View along road. Valley view. Car on road. 1953 - Soldiers test cold weather suits and boots in an icy stream in the snow on Mount Washington in New Hampshire. 1950s: Mount Washington excursion ship. Dock, lake, mountains, town.